Your Domain Name Must Be Available: Domain names must be unique, which means in order for you to claim your own, you need to be sure that it is currently available (and not being used by any one else at PSU). 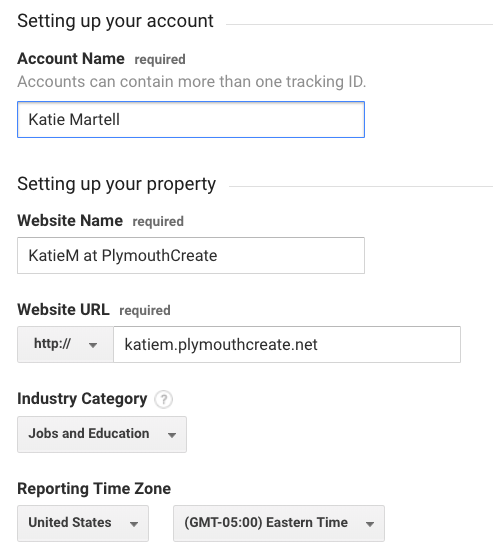 There are lots of tools to check on domain availability, and when you sign up on plymouthcreate.net, we’ll actually check the availability of your choice for you. 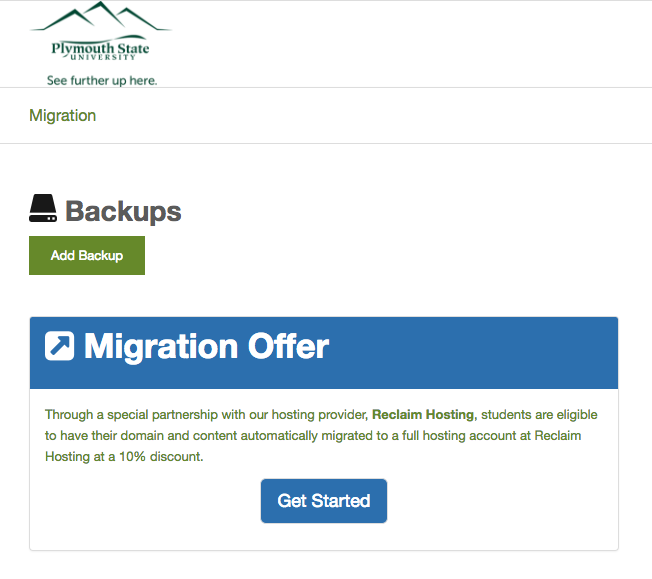 All PlymouthCreate domains contain “.plymouthcreate.net,” but when you leave PSU, you can migrate your website to another hosting account or company. 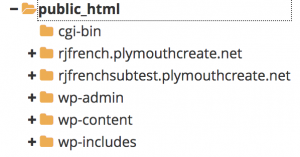 Enter the subdomain name you want for your PlymouthCreate website. When you’ve found an available subdomain, click the button labeled Click to Continue. Review your subdomain and contact information. It should be your first name, last name, and PSU email. Click Sign Up. After you click Sign Up, you will see a page letting you know that your domain is ready. You will then be redirected to the cPanel where you are on your way to creating your own PlymouthCreate space. 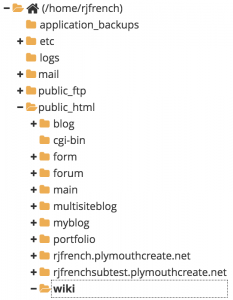 One aspect of plymouthcreate.net that users may find a bit complicated at first is understanding the different accounts (and associated passwords) that you can manage as part of your participation in the project. This article outlines the types of accounts that you are likely to have, what they are for, and how you go about resetting passwords on each of them. When you first sign-up for your domain and hosting, a cPanel account will be generated that provides you with access to your slice of the plymouthcreate.net Web server. 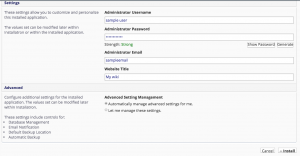 Your cPanel account is automatically associated with your PSU CampusID. Therefore, your PSU CampusID will grant you access to your cPanel account. What you put up in your plymouthcreate.net space rests entirely with you. You can choose not to pick a domain that reveals your name. You can use a pseudonym on your actual site. However, when you sign up through the default process, your name does get published as part of the public record about your domain name. 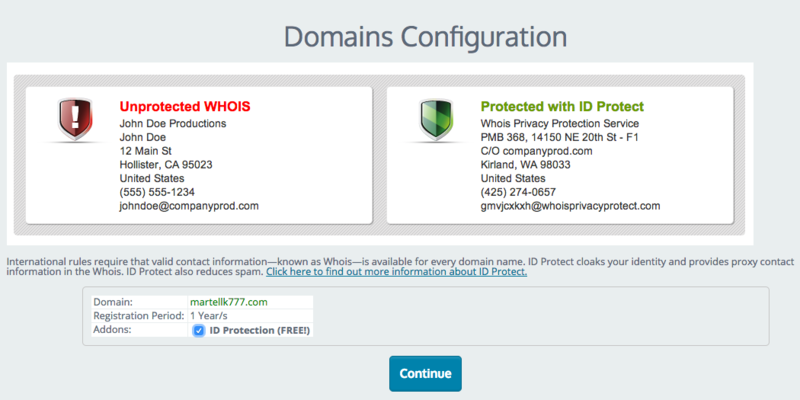 Anyone can find it by looking up details about the ownership of that domain name through a public “Whois” request. Your ability to do things on Plymouth Create is dictated to a large degree by the limits of your imagination. That said, there are some technical requirements and limitations that you should be aware of and might want to review. ZenPhoto: This application is a good choice if you’re looking for a way to share images in your Web space. It’s also a quick install through Installatron in cPanel onto your Plymouth Create Web space. 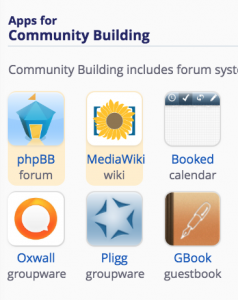 These are just a FEW of the open-source applications that are available to you in your Plymouth Create Web space. We encourage you to read more about what Web applications are and which ones are available to you through this project. Plymouth Create currently utilizes subdomains of .plymouthcreate.net for the initial signup, however after using your space you may decide you’d like to register a top-level domain (a .com, .net, .org address). You can do this by registering a domain with a service provider (we make a recommendation below, but any domain provider should work) and adding it to your space as an Addon Domain. 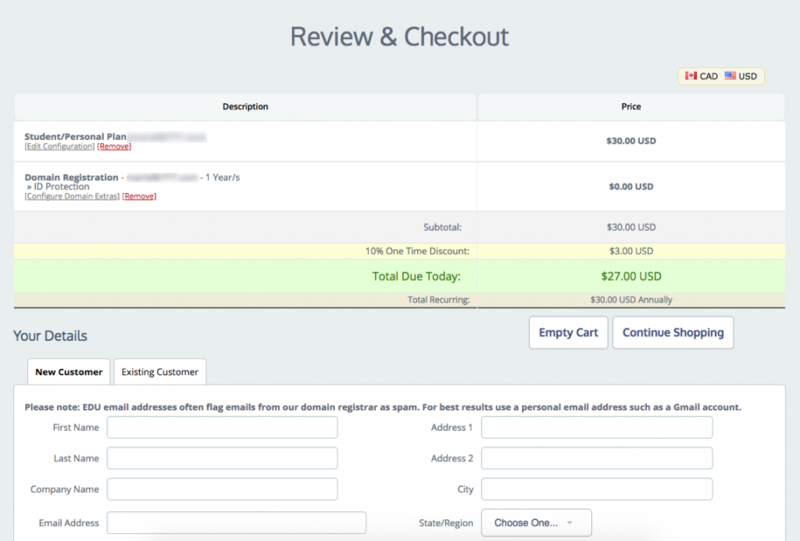 Once you’ve completed the checkout process with payment information the domain will be registered automatically. The last step is to add it to your existing account here at Plymouth Create. 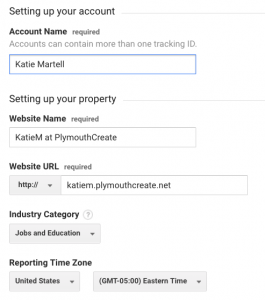 To do that you’ll log into your account at https://plymouthcreate.net/dashboard and in cPanel navigate to Domains > Add-on Domains. Here you will type in the domain that you registered previously to host it within your space on Plymouth Create. cPanel will also setup a subdomain which you can leave with the default that it creates and verify a location for the files for the domain (typically a folder inside of public_html). 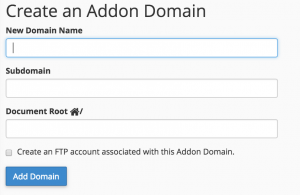 The option to create an additional FTP account is present but not necessary. Once the domain is entered click Add Domain to add the domain to your hosting account. 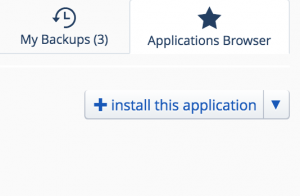 The system we use for PSU Create uses a special script installer called Installatron (in cPanel) that allows you to automatically install dozens of open source applications. 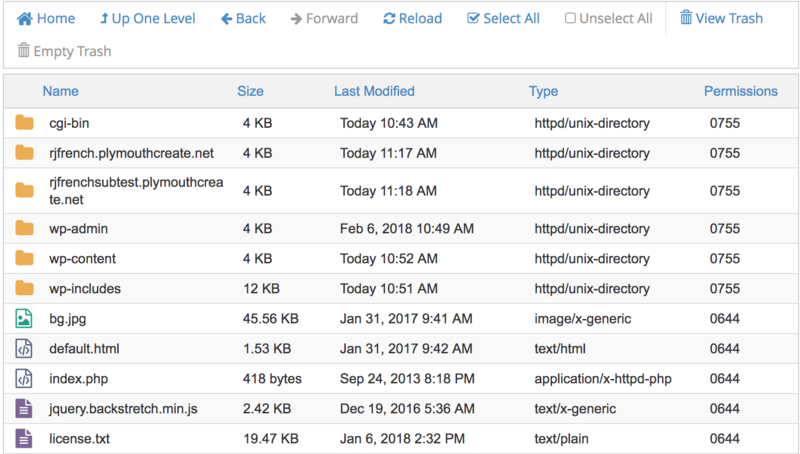 When you use Installatron, you don’t need to worry about moving files, creating databases, or doing the initial configuration. It’s all taken care of for you. You can find out more about Installatron here. In order to run on the PSU Create server, Web applications must be able to run on a LAMP server, which is the particular kind of Web server that we use. Occasionally, a Web application may require additional components or modules that need to be installed on the server. When you sign up for plymouthcreate.net, you get space on a Web host that is associated with the project. There are a few things you need to know about the Web host that will make it easier to understand what you can do with your new space. The Web server is the main computer that is associated with the plymouthcreate.net hosting account. It is literally a computer – a computer that has special software on it that allows it to be accessible via the Web. The files that run your applications, images or video you upload, or any other files you upload into your Web space are stored on this server. In order to run, a Web server has an operating system installed and some kind of Web server software. The plymouthcreate.net server runs the 'LINUX' operating system and an 'APACHE' Web server. Databases come in LOTS of varieties. The kind of database you can use for a Web application depends on the kind of software that’s installed on the database server. 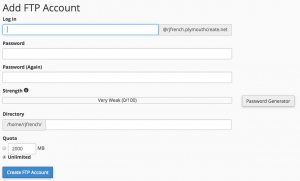 The plymouthcreate.net server can run 'MYSQL' databases. The plymouthcreate.net server has software installed on it that allows it to understand 'PHP', 'PERL', and 'PYTHON'. In WordPress, you can embed a tweet into a blog post. The tweet will be automatically formatted to match what it looks like on Twitter. In addition, viewers of your blog can interact with an embedded tweet, and even “like” it if they are logged into their Twitter account. See the video tutorial below to learn how to embed a tweet into your post. WordPress allows users to embed their Twitter timeline directly into a website in the form of a widget. Widgets can be placed in several areas of a site, and are easy for viewers to see and interact with from the site’s front page. See the video below to learn how to embed a Twitter Timeline into a site. As mentioned in the opening paragraph, talking about social media is an ever-changing and moving target and this article can never be truly comprehensive. The goal of Plymouth Create is to have you thinking more critically about where you put your content, not that you don’t participate in these networks which still have a lot of value, but rather that you own the work you create. Facebook, Twitter, LinkedIn, and others all have different audiences and the more places you push your content to, the more opportunities for discussion and feedback you’ll receive. The ability to network with an increased amount of people that isn’t reliant on face-to-face meetings is a powerful change in how we interact on the web and the value of it. As you begin to explore social media the best recommendation would be to choose a space you want to explore and really dive in. Follow as many people as possible, talk to them, respond to their work, and you’re more likely to get responses in return that start to build that sense of community for you. Generally, if you are using applications available to install by default through the plymouthcreate.net server, you shouldn’t need to worry about these technical details. All of the software that is available for installation (in cPanel) meets the technical requirements. Accessing cPanel has become even easier now! 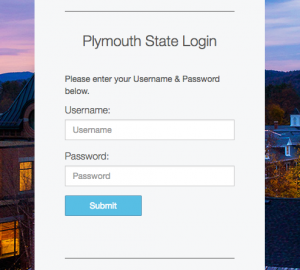 All you need to do is login at the top right of the page at plymouthcreate.net (with PSU username and Password) and your website’s cPanel will automatically be displayed upon login. To get started you’ll need to login to your control panel by going to https://plymouthcreate.net/dashboard/. Here you’ll login with your PSU CampusID and password. Login to plymouthcreate.net with your Plymouth username and password, after clicking “Login with Shibboleth”. In the navigation menu, choose the public_html option. This will take you directly into the folder that contains the files associated with your website(s). You’ll notice your current location (the public_html folder) is bolded and highlighted in this menu. Click the [+] (expand) icon next to a folder to see what subfolders it contains, or click on the name of the folder to view all of its contents in the file browser on the right side of the page. You can also navigate through the folders in your account by double-clicking on them in the file browser on the right side of the “File Manager” page. On the homepage of your control panel you’ll have all the various tools listed. You can easily find the File Manager by using the search tool in the upper righthand corner and typing File Manager. You can also find its icon under Files. 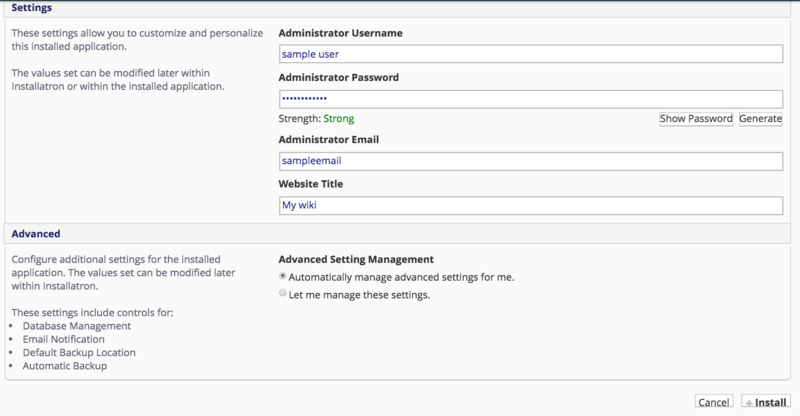 This screen will allow us to setup an email address that uses a mailbox stored on the server. You will be able to access mail sent to this email address either through a webmail client or a desktop/mobile client directly. Enter the desired email address as well as a password to associate with that email address. You can choose to set a quota for how large of a mailbox you need, or set this to unlimited (keep in mind your quota will still be dictated by the limits of the hosting account). Once you’re done click Create Account. If you already have an email address you want to use like a Gmail or Hotmail account, you may wish to create an Email Forwarder instead of a mailbox. 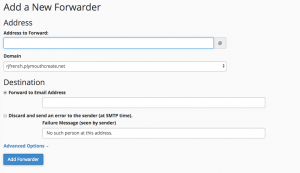 Setting up a forwarder is very simple. 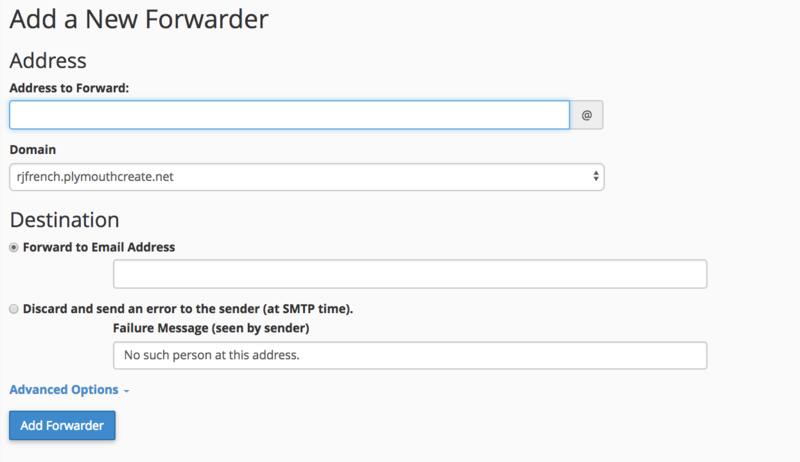 Start by clicking on Forwarders from the Mail section of your control panel homepage. Once logged in you’ll be at the homepage of your control panel. The easiest way to navigate the panel is using the search feature in the top right panel. Click the Search box and type “subdomains” (without the quotes). When you press enter, you will automatically be take to the Subdomains page. 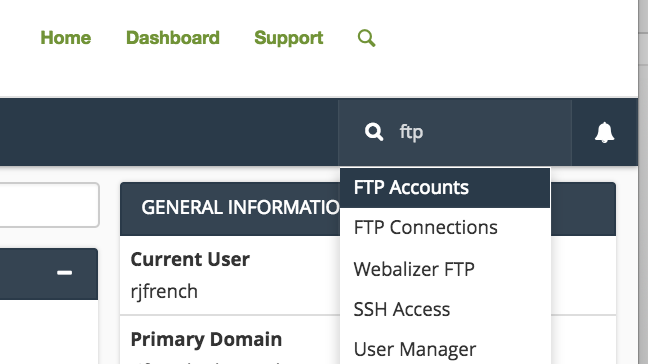 Or, you can scroll down and click the Subdomains button on the cPanel. Choose a name for your subdomain and type it into the Subdomain box. Just like top-level domains (e.g. johnsmith.plymouthcreate.net), subdomains can only contain numbers, letters, and hyphens, and the best subdomains are simple, short, and descriptive.
. If everything went well, you should see a message that your subdomain was created successfully. 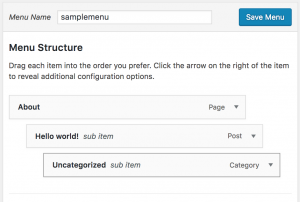 Your subdomain will now be available as an option for automatic installation of various software (WordPress, MediaWiki, etc). If you prefer to install web applications manually, you can do so in the document root (folder) you created in step 5. Subdomains a nice option when you are tasked with creating sites for two or more separate classes. If you need assistance setting up subdomains, please contact helpdesk@plymouth.edu. Let’s say you’ve registered a new domain for plymouthcreate.net called yourdomain.com. Anything that is stored at this core URL is considered to be at the root of your domain: Nothing comes before the address or after the address. You can certainly decide that you simply want to have a single site on your Web host (say a blog running WordPress), and you can set that blog up at your domain’s root. To get to your site in this scenario, users would simply go to yourdomain.com. You’re already familiar with the concept of subdomains, even if you don’t know it. Consider PSU’s public Web site at http://campus.plymouth.edu. As you browse parts of that site, you’ll notice that the domain changes. When you’re looking at a university’s library Web site, say the site for Lamson Library at http://library.plymouth.edu/, the URL is no longer campus.plymouth.edu. Now the root of the url is library.plymouth.edu, indicating that you’re on the part of the site that is dedicated to information on the Lamson Library. 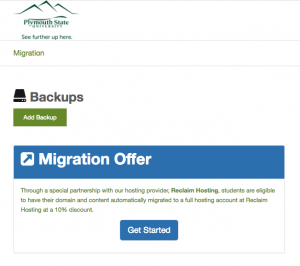 You will lose access to your PlymouthCreate domain as early as 30 days after you graduate (or otherwise discontinue) from Plymouth State, so it’s essential that you back up your site content prior to leaving campus. You have a number of options: pay Reclaim Hosting $30/year to keep everything and migrate to your own domain, download your entire site to store on your computer, or move everything over to another hosting provider. 3. Click Get Started in the Migration Offer box. 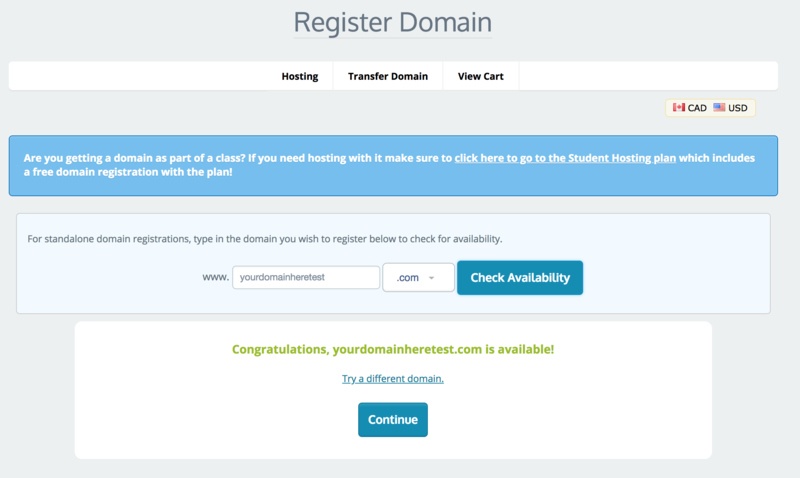 If you haven’t purchased hosting from somewhere else, the Register a new domain option allows you to get your own personal domain with Reclaim Hosting (outside of PlymouthCreate). Your site will no longer be located at “yoursite.plymouthcreate.net” and you’ll be able to purchase a new URL. 5. Once you select an available domain (consider using your name for a professional site), we recommend adding on ID Protect by checking the ID Protection checkbox. 6. On the next page, you’ll see an order confirmation and you’ll then be required to enter your account details to officially purchase your hosting plan. 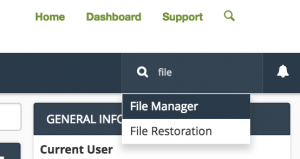 If you’re not sure what you’d like to do with your website or content, you can download a full backup directly from your cPanel. This would also be the route to take if you’re migrating your site to a hosting provider other than Reclaim. 2. Head to the Files section of cPanel, click on the Backup icon. 3. Under Full Backup, click Generate/ Download a Full Website Backup. 4. On the next page, select the Home Directory option from the Backup Destination drop-down menu. 5. For Email Address, select whether or not you wish to receive an email notification once the backup is complete. (You may also change the notification email address in the provided field if you wish.) Click Generate Backup. 6. Consider storing your backup in multiple places, like on a flash drive, on your computer’s hard drive, and also in a cloud-based account. 7. Contact your new hosting provider for instructions on how to transfer your content. If you would like to move your WordPress site from your Plymouth Create account to either a free WordPress.com account or a different paid host, you can do so with the export system built into WordPress. Please see Exporting from WordPress. A name server is a computer, running as a server, that keeps a record of all the domain names that are associated with it and keeps track of where those domains should go. 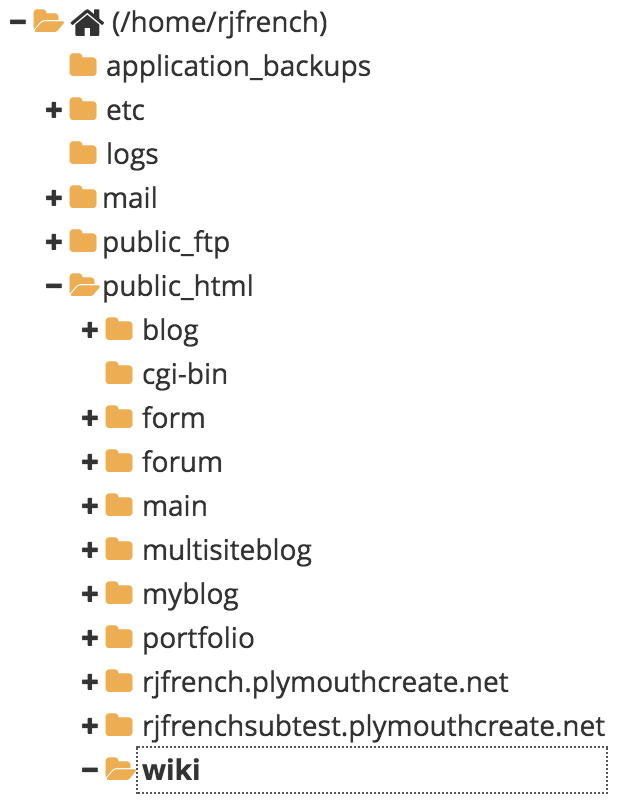 In the case of plymouthcreate.net the name server is the same computer that runs the hosting. You can peek behind the hood and see this in action by going to the 'Websites and Domains' tab of your panel account and clicking on 'DNS Settings'. You see, DNS stands for Domain Name System and the name server on plymouthcreate.net gives control to it to identify what should be displayed when someone types in your domain. Consider the fact that you might have one or more subdomains in your account. The name server and DNS are able to identify those subdomains and let the world wide web know that they exist and point to some files/folders on a computer somewhere. When you signed up for a domain through the plymouthcreate.net system your name servers were chosen for you. So when people type in your address, the server responds with information about your account. When you migrate an account away from one hosting platform like plymouthcreate.net and onto a new service, it will require you to change the name servers so that your domain name points to a new server with its own files and structure. 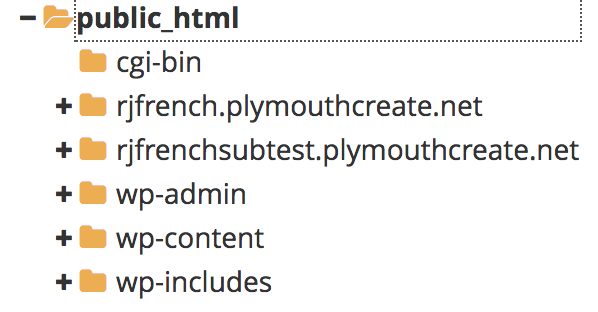 It’s also possible to have subdomains that point to entirely different servers than plymouthcreate.net. 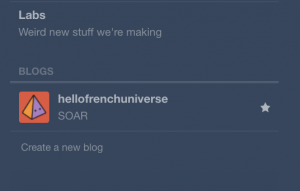 For example, you could have a subdomain that looks to Tumblr for files. A subdomain is one way of organizing and separating content on your site. You’re already familiar with the concept of subdomains, even if you don’t know it. Consider PSU’s public Web site at http://plymouth.edu. As you browse parts of that site, you’ll notice that the domain changes. When you’re looking at your department Web site, the URL is no longer just plymouth.edu. Now the root of the url is campus.plymouth.edu, indicating that you’re on the part of the site that is dedicated to internal information at Plymouth State. If you browse to the library information pages at http://library.plymouth.edu, you’ll notice that the domain changes again, this time indicating that you’re in the library section of the PSU site. 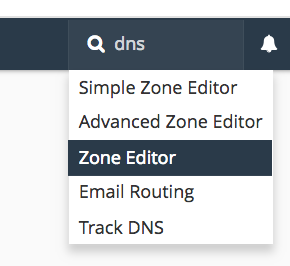 Go back to the window or tab containing the Advanced DNS Zone Editor in your plymouthcreate.net cPanel. In the Add a Record section, paste the text you just copied into the Name field. This information will be different for each domain. Set the TTL field to 14400, and the Type drop-down menu to CNAME. Go back to the window or tab containing the Advanced DNS Zone Editor in your plymouthcreate.net cPanel. In the Zone File Records section, find the domain you were editing Action for and paste the text you just copied into the CNAME field. This information will be different for each domain. Click Edit record when you are done. Once logged in you’ll be at the homepage of your control panel. The easiest way to navigate the cPanel is using the search feature in the top right panel. Click the Search box and type “DNS” (without the quotes). As you type, the cPanel page will begin to narrow down results. Find and click on Zone Editor to continue. To the right of your domain, click “Manage“. In the right panel, select the blog you’d like to map. On the Tumblog you’d like to use, under Username, click the pencil icon to edit. 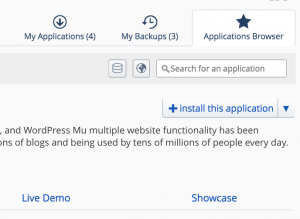 Then, scroll down and look under Web Applications, then click the WordPress button. By default the installer will automatically backup your website and update it anytime a new version comes out. While we recommend you keep this option, it is possible to only do minor updates, or turn them off completely. The installer will also create a database for you automatically, but if you’ve already created one for this website you can choose Let me manage the database settings and enter the details. Finally, you’ll need to create an initial username and password for the WordPress install. Enter that information in final section and click Install. You’ll now be presented with a screen that includes a section titled Menu Settings. 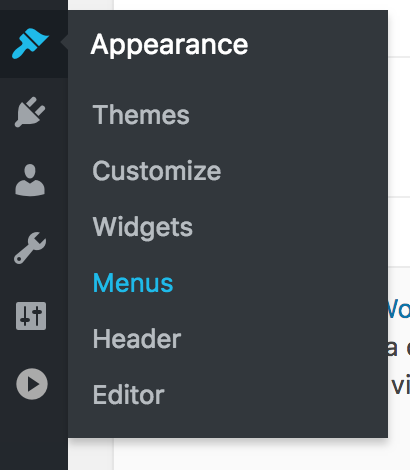 This is where you’ll indicate where you want your menu to appear in your theme. The number of locations available depends entirely upon the theme you choose. In the example shown below, there are two areas available; we’ve chosen to place the menu in the Top Menu area which we know corresponds to the header menu. 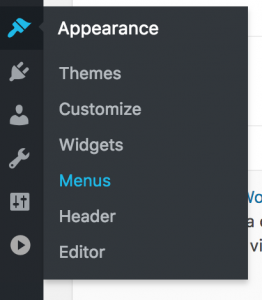 You may need to experiment a bit in order to find out where your menu will appear in your theme. You can always change this location later by coming back here and clicking the Manage Locations tab. By default, you may not see everything that is available to you to add to your menu. 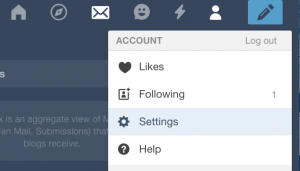 For example, posts can be added to menus, but they’re not usually displayed by default. 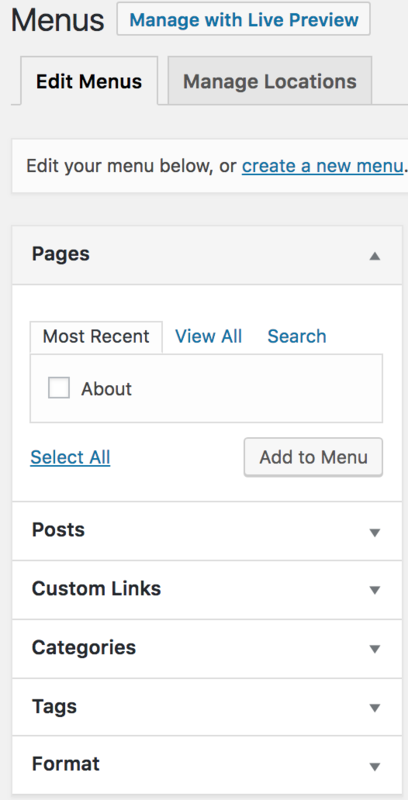 To make more content available, click the Screen Options tab at the top of your WordPress screen, and then click off the check boxes that correspond to additional content. When you open the WordPress app, tap Add Self-Hosted Site. 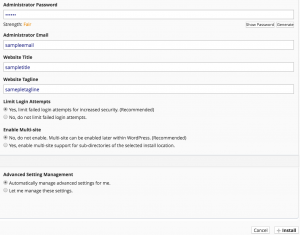 Then, you will be able to enter your WordPress site credentials. With these credentials, enter them into the WordPress App along with the url for your WordPress website and select Add Site. 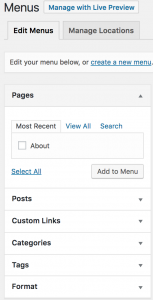 On the next page, you will see all of the WordPress websites you have added to the WordPress App. Select the site you just added. On this page, you can navigate your post, pages, comments, and more! To start a new post, tap on the Pencil Icon. On this page, add your Title and Content. You can also edit the properties of text by selecting the text and the different Text Property Buttons. Once you arrive on the Akismet for WordPress site, click the Sign up for Akismet Now button. 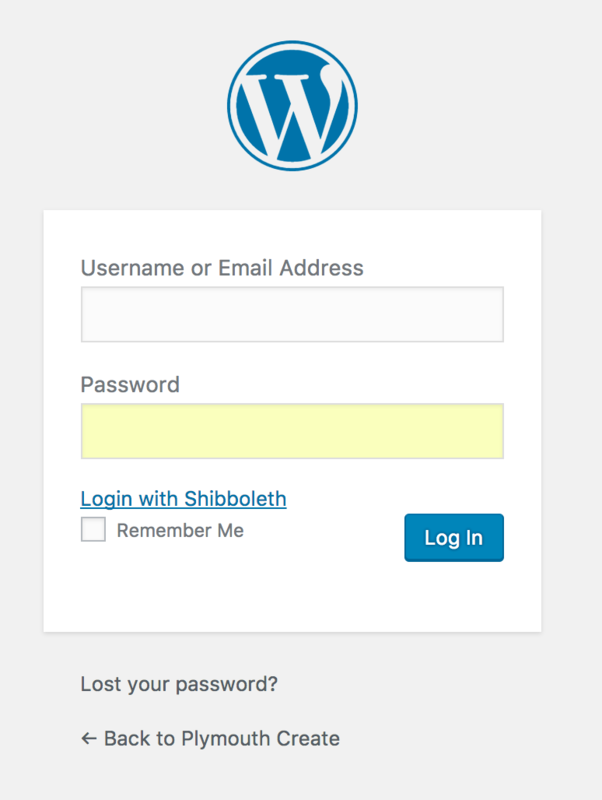 You will be prompted to log in with your WordPress username and password. Note, this may be different from your Plymouth State login credentials. Click the Sign up button to proceed. You’re finished with the sign up process for your key, and it will be displayed on the page for you. Now follow the steps that they show you for using your new key. You will enter the key in either the Akismet area under Plugins or JetPack (if you have that installed). 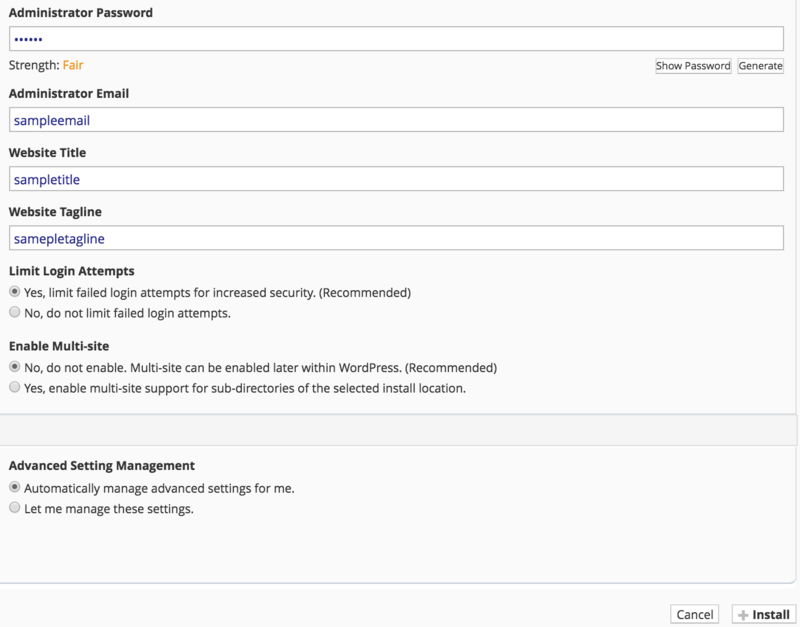 Go back to your WordPress dashboard, and click Activate under the Akismet plugin. Enter the API key and click Use this key. You’re done! With Akismet activated, spam will be filtered automatically from contact forms and comments sections. 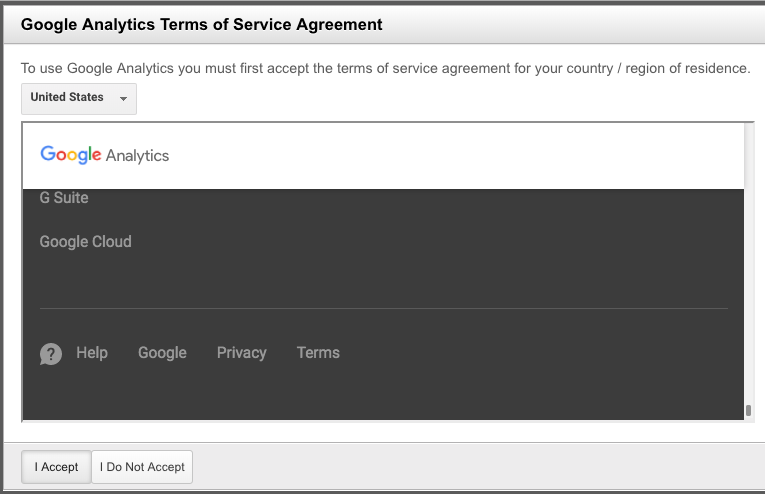 The best way to know your audience is through your traffic stats, and this is what Google Analytics provide for FREE. Google Analytics will help you make data-driven decisions by showing you the stats that matter most. 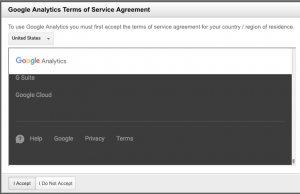 1.The first step is to create an account on the Google Analytics site. 2. You will be asked to log in to your Google account. 4. Fill out the form with your information— make sure that your website URL is entered correctly. 7. On the next page, your Tracking ID will be displayed along with a disclaimer that you still need to set up Google Analytics on your website. Leave this tab open so you have the Google Analytics information readily available. 8. So that you can view your Google Analytics right in your WordPress dashboard, the next step is to install a plugin called “Monster Insights.” To get started, click on Plugins, then Add New from the WP menu. 9. In the search bar, enter “Monster Insights,” and once you find the plugin, click the Install Now button. Once installed, click the Activate button. 10. Click on Plugins in your WP menu, and you should see the newly activated Monster Insights plugin. Click “Settings” to begin configuring the plugin. 12. 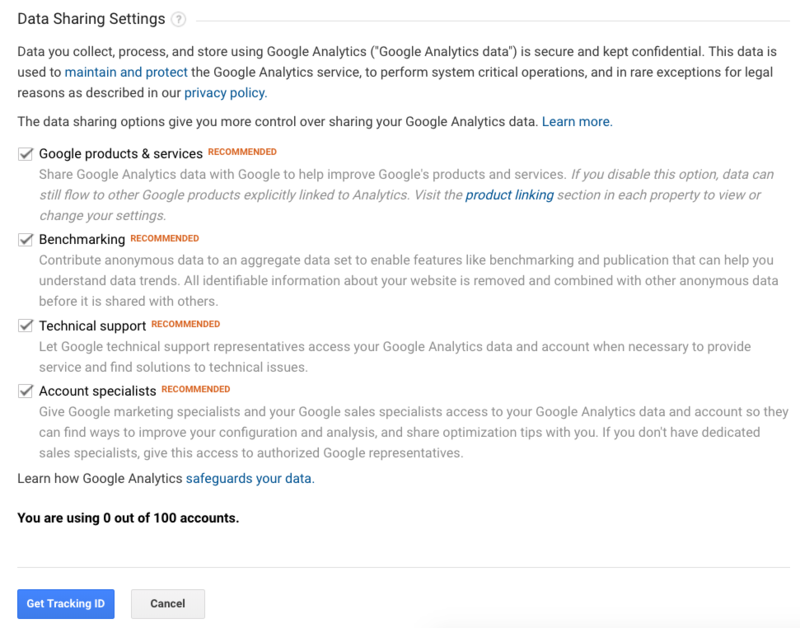 Next you’ll either login or the select the Google account you used to set up your Analytics account. Then agree to the Google settings. 13. Select “All Web Site Data,” tell Google you’re not a robot, and click Complete Authentication. 14. You’ll be taken back into Monster Insights in your WP account. Click Save changes. 2. From the left side menu locate and click plugins. 3. You will be given a list of all your currently installed plugins. 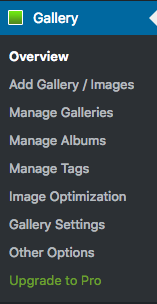 Additionally you may also sort through installed plugins using the sorting options above the bulk action menu. 5. You will then be redirected to a search engine where you can search using general or specific terms to find plugins. – For example searching “photo gallery” brings up various plugins from different developers. 6. 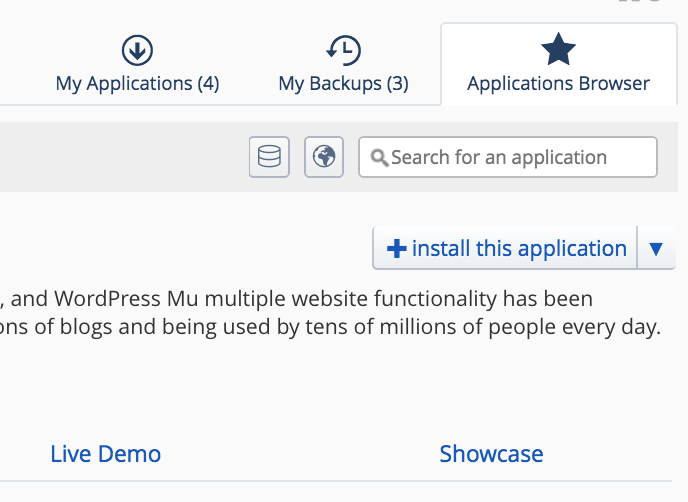 Once you find your desired plugin, click “install now,” which will automatically install the plugin and prompt you to activate it now or return to the menu. Click Activate to begin setting up the plugin. 7. After installing your plugin, be sure to visit the developers’ website if you have any additional questions about how the plugin works, as some plugins may require certain codes or other actions to be used properly. 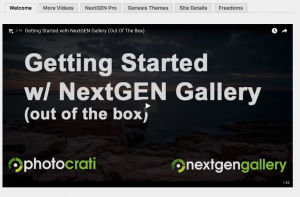 The example listed above, NextGEN Gallery, has a “Gallery Setup Wizard” and a getting started video, as well as a standalone menu item that will display after activation. 8. Some plugins will have their own settings page located under the 'Settings‘, other plugins will break out their own menu item on the left hand side of the Dashboard. The best way to understand how to use a plugin is to make sure you’ve read the documentation available on the plugin’s website as every plugin behaves differently and sometimes it won’t be explicit how the plugin interacts with your website. There are a variety of plugins that enable additional functionality in Omeka. All the plugins available for Omeka and their descriptions can be found on this page. 1. Find the plugin, and click the green button on the right to download the zip file. 4. Next you will need to upload the zip file you downloaded into the plugins folder. Select the Upload option in the top menu to open up a new tab where you can upload the zip file. When the upload is complete, click the ‘Go back to home/yourdomain/public_html/omeka/plugins’ link at the bottom of the page to return to the File Manager. 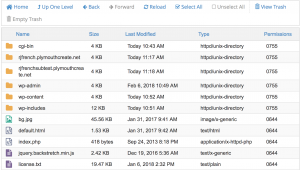 You will see that the zip file has appeared in the plugins folder. 5. Make sure the zip file is selected (it should be highlighted in blue), then click Extract from the menu at the top of the page. 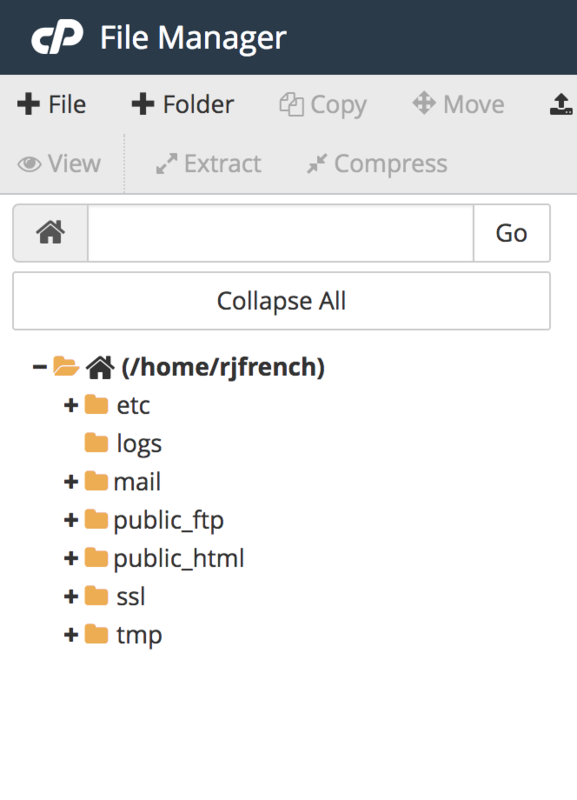 A small window will open up to confirm where the file will be extracted to. If you were in the plugins folder, it should say public_html/omeka/plugins, if not, type that into the box before you hit Extract File(s). 7. The plugin should now be available in the plugins tab in your Omeka. Once logged in you’ll be at the homepage of your control panel. Navigate the Web Applications section of the cPanel and click All Applications to find the Featured Applications. Then find and select MediaWiki. On the next page the installer will ask for some information about this install. The first thing you’ll want to do is decide where to install it. If you’re wanting to install MediaWiki on your main (the root) domain, you can leave the directory area empty. 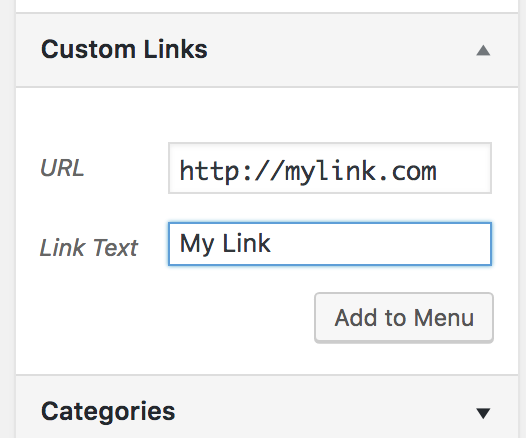 If you created a subdomain, you can select it from the dropdown menu. You also have the option of installing MediaWiki in a subfolder by typing in the folder name in the Directory field. On a WordPress site, you may want to add a Creative Commons license. Creative Commons licenses will allow others to share your work, making it more open and accessible. The amount of freedom that others have with your work is dependent on the type of license you select. The Creative Commons “Choose a License” feature allows users to take a quick quiz to determine what license is best for them. For example, a license that Creative Commons offers is the CC Attribution License (CC BY 4.0). This license will allow others to share and adapt your work if attribution is provided. Once a license is selected using the “Choose a License” feature, Creative Commons will generate code that can be embedded into WordPress. You can apply a Creative Commons license to a WordPress post or page, or you can apply a Creative Commons license to your entire site. To add a Creative Commons license to a post on your WordPress site, you will need to embed the license HTML into a block on the post editing screen. 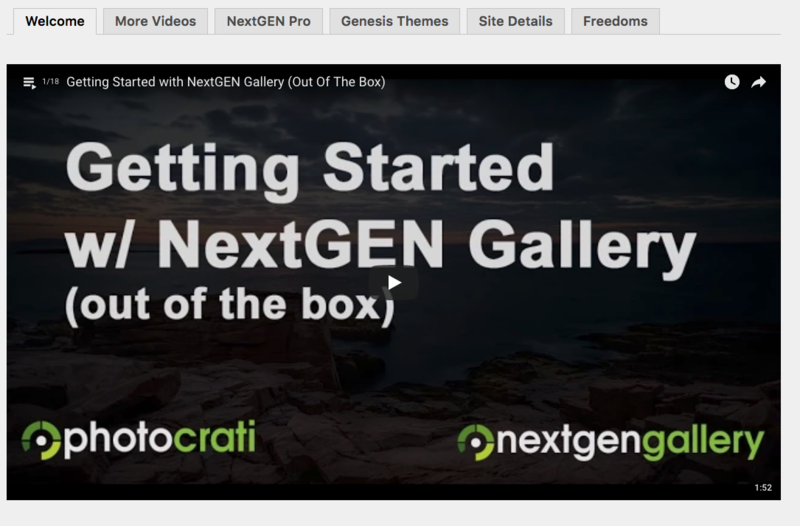 To learn how to embed Creative Commons license into a post, see the following tutorial video. A widget at the footer of your site is the best way to apply a Creative Commons license. A widget will appear at the foot of every webpage that a viewer navigates to. See the following tutorial video to learn how to place a Creative Commons license into a widget at the footer of your site. Public domain works are free from copyright restrictions. This means that the work can be used by the public in any way and has no attribution requirement. Through Creative Commons, a work can be placed into the public domain through the “No Rights Reserved” (CC0) license. This license is used by copyright holders who wish to release a work from copyright restrictions. 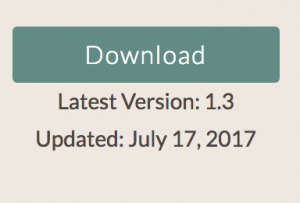 For WordPress, this will typically be the most appropriate license for placing content in the public domain. It should be added that there is another Public Domain license that Creative Commons offers. This is known as “No Known Copyright,” or public domain mark. This license should not be used by creators who wish to release their own works from copyright restrictions. For that purpose, use the CC0 license. To use the “No Rights Reserved” (CC0) license, navigate to the Creative Commons Public Domain page. Under the “CC0” heading, select “use this tool.” This will bring you to a form that will generate code for your WordPress site. See the above videos to learn how to place this code into your WordPress site. If you would like to export your data from your Create account, either because you are migrating your data or because you are closing your account, there are several options. 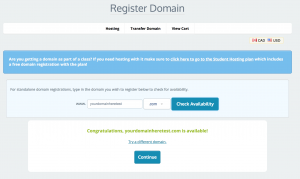 If you are leaving the university, you can migrate your domain from Plymouth Create to Reclaim Hosting. 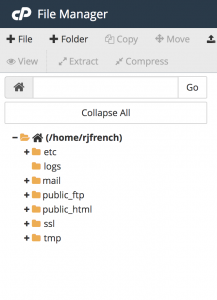 You can also find information on how to export the data from a WordPress installation in order to move it to another WordPress installation or move it to WordPress.com. If you would like to move your WordPress site from your Plymouth Create account to either a free WordPress.com account or a different paid host, you can do so with the export system built into WordPress. This process will generate an XML file of your blog’s content. 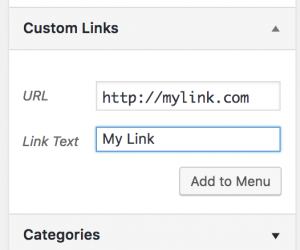 This format, which WordPress calls WordPress eXtended RSS or WXR, will contain your posts, pages, comments, categories, and tags. Note: This will ONLY export your posts, pages, comments, categories, and tags; uploads and images may need to be manually transferred to the new blog. 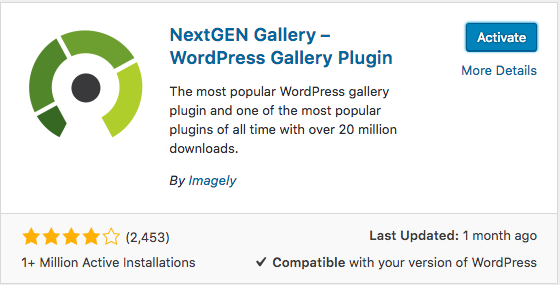 The current version of the WordPress.org installation gives you the option to import uploaded files, but the blog you are importing from must be live and serving images properly in order for it to work. So, do not delete your blog until after media files have successfully been imported into the new blog. If you are planning to export your content to another blog platform, it’s best to manually download and save your images from your WordPress.com Media Library to before trying to import/upload them into the new blog. This information has been adapted from the WordPress support material on exporting a WordPress site. For more information on exporting your WordPress site, please go to the WordPress Support site. Once you have exported your posts, pages, etc., you will import them into your new WordPress site. Choose the WordPress option at the bottom of the list of the services. Next you will see a screen that prompts you to upload the WXR file you generated through the export process. Choose and upload your file. You will then be prompted to assign an author to the posts that you are importing. 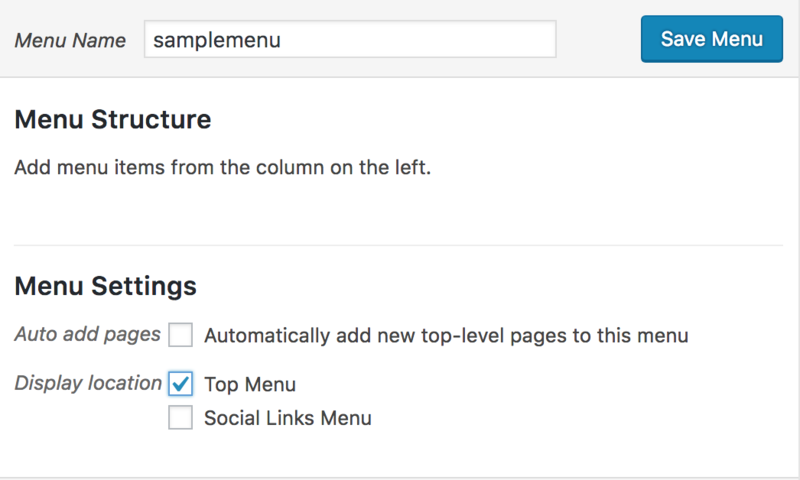 You can use this function to assign one author to all posts, or you can manually set the author for each post in the posts menu. You will also need to reinstall your themes and any plugins that you would like to continue to use. This information has been adapted from the WordPress support material on importing a WordPress site. For more information on importing your WordPress site, please go to the WordPress Support site.